Next week the catchily titled Museum of Brands, Packaging and Advertising will open its doors up in Notting Hill, and despite the rather unweildy name it looks like this is a new London attraction Londonist will be visitng before too long. The musuem is billed as displaying "200 years of consumerism, reflected through packaging design, brand development, poster and TV advertising," and yet it seems to be the result of just one man's obsession with packaging. When I’ve been to the supermarket I have to preserve the item, empty the contents, wash the container, label it and store the wretched thing! They’re going to explode if I don’t empty them! And I’m forever shifting things around! You wouldn’t believe the frustration of looking after these things! At the end of the interview the Times reporter comes away rather scared and suggests Opie should get out more. But we can't help think that someone who's put thid much work into his passion and has even got his own museum established for his troubles deserves a little round of applause. We'll definitely be buying a ticket. 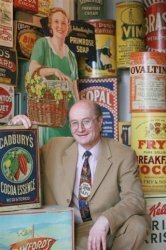 The Museum of Brands, Packaging and Advertising, opens next week at 2 Colville Mews, Lonsdale Road, London W11.